Kovalam is the most famous beach destination in Kerala. It is situated in just 16 km away from Thiruvananthapuram district, the capital city of Kerala. This is a Paradise of the South. That means a grove of coconut trees lining the whole area beyond the shores around Kovalam is offering magnificent views while approaching the beach. 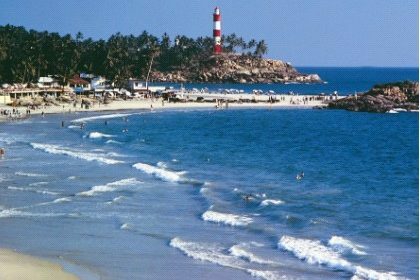 There are three beautiful beaches in Kovalam are the Light House Beach, it offers an eye catching sight of Vizhinjam Mosque, Samudra Beach is positioned at the northernmost end and the third one Eve’s Beach or Howah Beach , which is placed between the Light House Beach and Samudra, for famous with European Tourists. Eve’s or Howah Beach is ideal to spend a quite evening. Golden sands, miles of shimmering sea, rocky promontories constantly caressed by the sensuous surf and a brilliant sunshine warming the very souls, make this place truly sensational. Bus Station: Kovalam KSRTC Bus Stand is near Vizhinjam-Poovar Road.